Modiani Kitchens, the Englewood, NJ based kitchen cabinet and kitchen design company, is updating their showroom to feature Cesar’s latest model, Cesar Maxima 2.2. Modiani Kitchens, the Englewood, NJ based kitchen cabinet and kitchen design company, is updating their kitchen showroom to feature Cesar’s latest model, Cesar Maxima 2.2. Cesar Maxima 2.2 has been displayed in Milan and around the world and is being brought to the United States by Modiani Kitchens. The Cesar Maxima 2.2 has a lot of buzz around it, as Cesar recently introduced the addition of the Wall Waiter to this line. Wall Waiter is described by Cesar as “an innovative multifunctional module that can hold and organize many of the objects used in the kitchen.” The Wall Waiter features a pull-down shelf that becomes an extra shelf and an LED-illuminated worktop. 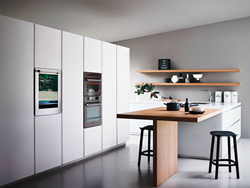 The Cesar Maxima 2.2 features all new finishes, which Modiani Kitchens has on display in their Englewood showroom. In addition to showcasing the Cesar Maxima 2.2, Modiani Kitchens is in the process of expanding their traditional lines with two new kitchen displays, which will feature intricate details and ornate styles. Modiani Kitchens is a kitchen design company based in Englewood, NJ, specializing in traditional kitchen design as well as modern European kitchen cabinets.